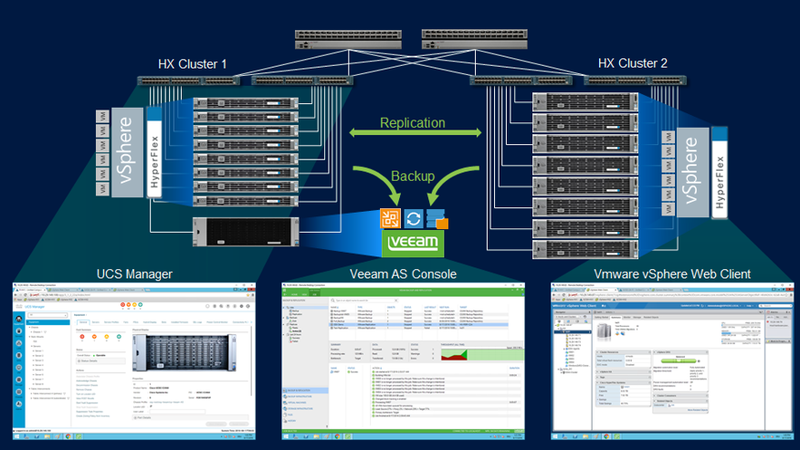 Cisco UCS S-Series with Veeam: The Availability experience you need! Veeam and Cisco have been working on a number of solutions over the years, and the latest is the new Cisco UCS S-Series storage server. In just a few short years, Cisco’s UCS platform has become the leader in converged infrastructures for high performance and agile data centers. Additionally, many customers and partners around the world have also found Cisco’s storage servers to be an ideal platform to build data protection and Availability solutions with Veeam. What is this Availability solution? It is an additional use case that keeps applications and data available. This is done by leveraging a server supporting the Veeam management and data movement between the primary storage and backup repository, as well as being the data repository for backups and replicated VMs. The latest news is great for those interested in fast data and application recovery with easy provisioning and scalable growth. Frequently, organizations struggle with decisions around deduplication appliances and tape devices. Both of these venerable solutions in the data center have some characteristics that may not be as desired. For example, deduplication systems may not be as fast (especially on restores) and everyone has a story of how tape has let them down. What if I told you that the Cisco UCS S-Series can solve both your long-term retention and storage efficiency needs? Deciding what is the best platform for all situations is a difficult recommendation to make, but one thing is for sure: Organizations of all sizes want the best performance and reliability for their data protection and Availability infrastructure. This is where the Cisco UCS S-Series and Veeam deliver. The Cisco UCS S-Series has been available as a Veeam appliance for a while now (when it was known as the Cisco UCS C3x60 Rack Server), which can be purchased through distribution. This is a great technology combination to get a high-performing storage server that functions as a Veeam repository. From a capacity perspective, the Cisco UCS S-Series servers offer an incredible and scalable approach to storage server resources. Current models can offer up to 600 TB of raw storage capacity that scales to petabytes easily with Cisco UCS Manager. The scaling and management is a significant point; raw compute and storage infrastructure is good, but having a framework that can reduce management and operational overhead through automation is what organizations want today to be agile. From a performance perspective, the Cisco UCS S-Series offers incredible performance with the Fabric Interconnects for throughput up to 40 Gbps. This is very critical when it comes to the data flow of backup and data protection environments. Much of the traffic is at the infrastructure level, from the storage itself, and the Fabric Interconnect is a great mechanism to ensure the best performance. Additional features such as Veeam Backup I/O Control can help ensure the performance of any primary storage resources (in regards to latency) as well. From a long-term retention perspective, the Cisco UCS S-Series gives you both performance and storage efficiency options. The high capacity and performance are a great way to store Veeam backup data long term. Couple Veeam’s new capabilities with Windows Server 2016 and the Advanced ReFS Integration — and the ability to create synthetic full backups with near instant speed — and you get a serious contender to replace tape with backups on disk with Cisco UCS S-Series servers. It is worth highlighting that the ReFS BlockClone API is used to get this performance benefit, but it also introduces storage efficiency. This means that Veeam and Cisco UCS S-Series customers will enjoy even shorter backup windows and lower backup storage loads. This reduced backup storage capacity consumption rivals that of a deduplication appliance without having to pay the recovery time penalty for rehydrating deduped data. Multiple use cases and design options are described in the Cisco Validated Design (CVD) such as the one below. Cisco and Veeam have been a long-standing team that provides the Availability experience organizations want today. Do the capacity, performance, manageability and connectivity characteristics of the Cisco UCS S-Series servers appeal to you? They should! What do you want out of a server-based backup storage system? Share your comments in this blog.